The right mix of hydrogen bonds in polymer and cement composites is critical to making strong, tough and ductile infrastructure material, according to Rice University scientists who want to mimic the mechanics of mother-of-pearl and similar natural composites with synthetic materials. Seashells made of mother-of-pearl, aka nacre, get their remarkable properties from overlapping micron-sized, mineralized plates held together by a soft matrix. This structure can be approached by cement and polymer composites that may, for instance, make better earthquake-resistant concrete, according to Rouzbeh Shahsavari, an assistant professor of civil and environmental engineering. 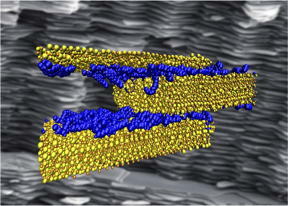 The Rice lab ran more than 20 computer simulations of how polymers and cement molecules come together at the nanoscale and what drives their adhesion. The researchers showed that the proximity of oxygen and hydrogen atoms is the critical factor in forming a network of weak hydrogen bonds that connects soft and hard layers. Common polyacrylic acid (PAA) proved best at binding the overlapping layers of cement crystals with an optimal overlap of about 15 nanometers. "This information is important to make the best synthetic composites," said Shahsavari, who ran the project with Rice graduate student Navid Sakhavand. "A modern engineering approach to these materials will have a large impact on society, especially as we build new and replace aging infrastructure." The lab's results appear in Applied Physics Letters. While engineers understand that adding polymers improves cement by blocking the damaging effects of "aggressive" ions that invade its pores, details about how the materials interact at the molecular scale have remained unknown, Shahsavari said. To find out, the researchers modeled composites with PAA as well as polyvinyl alcohol (PVA), both soft matrix materials that have been used to improve cement. They discovered that the two different oxygen atoms in PAA (as opposed to one in PVA) allowed it to receive and donate ions as it bonded with hydrogen in the crystals of tobermorite cement. Oxygen in PAA had eight ways to bond with hydrogen (six for PVA) and could also participate in salt bridging between the polymer and cement, which makes the bonding network even more complex. The researchers tested their simulated structures by sliding layers of polymer and cement against each other and found that complexity allowed the bonds between PAA and cement to break and reconnect more frequently as the material was stressed, which significantly increases its toughness, the ability to deform without fracturing. This allowed the researchers to determine the optimum overlap between cement crystals. "In contrast to the common intuition that hydrogen bonds are weak, when the right number of them -- the optimum overlap -- cooperate, they provide sufficient connectivity in the composite to confer high strength and high toughness," Shahsavari said. "From an experimental standpoint, this can be done by carefully tuning and controlling the addition of the polymers with the right molecular weight while controlling cement mineral formation. Indeed, a recent experimental paper by our colleagues showed a proof of concept toward this strategy." The National Science Foundation (NSF) supported the research. Supercomputing resources were supplied by Rice's NSF-supported DAVinCI supercomputer administered by the Center for Research Computing and procured in partnership with Rice's Ken Kennedy Institute for Information Technology. Located on a 300-acre forested campus in Houston, Rice University is consistently ranked among the nation's top 20 universities by U.S. News & World Report. Rice has highly respected schools of Architecture, Business, Continuing Studies, Engineering, Humanities, Music, Natural Sciences and Social Sciences and is home to the Baker Institute for Public Policy. With 3,970 undergraduates and 2,934 graduate students, Rice's undergraduate student-to-faculty ratio is just under 6-to-1. Its residential college system builds close-knit communities and lifelong friendships, just one reason why Rice is ranked No. 1 for quality of life and for lots of race/class interaction and No. 2 for happiest students by the Princeton Review. Rice is also rated as a best value among private universities by Kiplinger's Personal Finance. To read "What they're saying about Rice," go to http://tinyurl.com/RiceUniversityoverview .